If experiencing poor sound in church could be measured as pain and people are not complaining about it, it could be because they don’t consider taking 10 extra strength pain killers per worship service as overdosing. 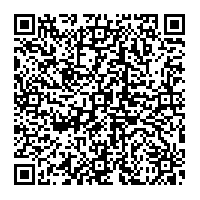 This information has be written for the layman and should not be used as technical information. Many terms and descriptions are simplified for educational reading. It’s 10:00am Sunday morning. The invited Gospel group just showed up an hour late. You have 45 minutes to set up, do a sound check and rehearse the group long enough to know what kind of sound they are best known for. One by one the performers enter with their instruments. This group is planning to use the church sound system. Rumor told them that this church had a very good system. You see one electronic organ, two electronic keyboards, one string bass with a pickup and one electric guitar with an amplifier head. Finally, you see an electronic drum kit. At the front of the church you have 16 mic inputs. You need 5 vocal mics and 9 inputs for the instruments. That leaves you with a pulpit mic and a tape player input. Fortunately, you were prepared. Earlier in the week you rented 1 speaker director, 5 passive direct boxes and 2 active direct boxes. The church already owned 2 passive direct boxes. 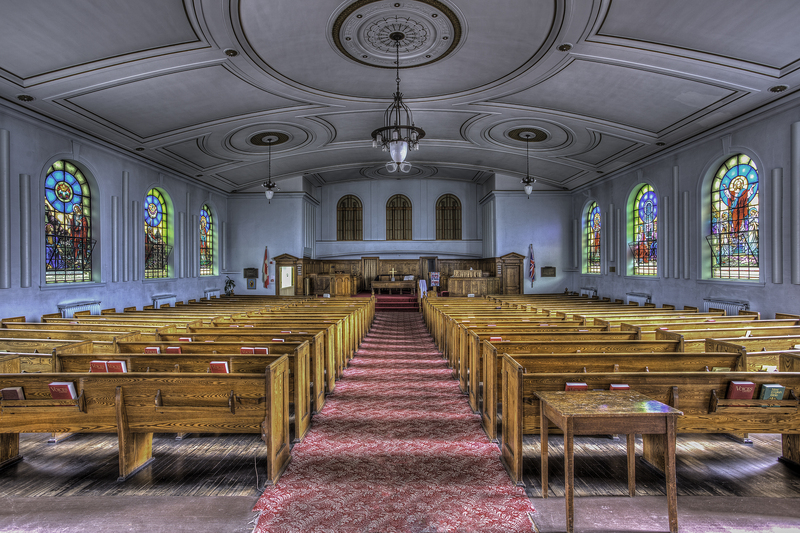 By 10:30, the sound check was finished with the soundman sitting at his mixer in the pew and 10 minutes later the group finished their rehearsal and floor monitor check. At 11:00am, service started and the group performed very well. Most people were not aware that the group set up in only 45 minutes. Is this really possible? 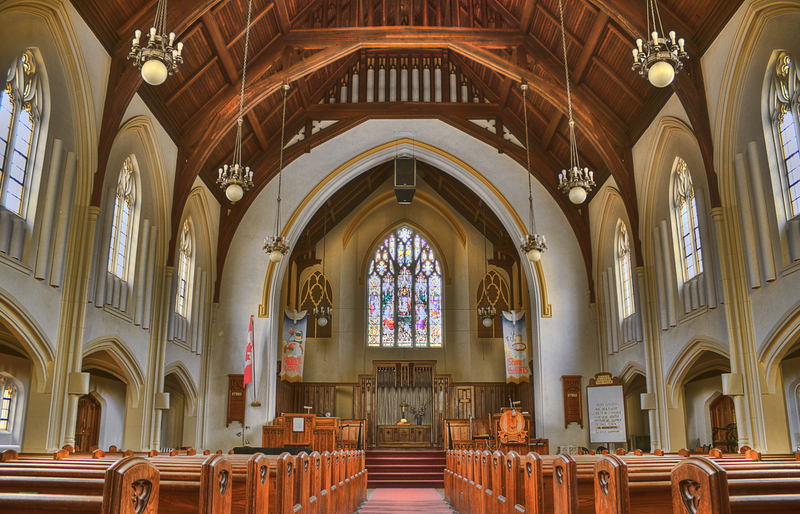 Ever since the 16mm film projector was used in the church and connected to the sound system, churches have needed a direct box (or DI box). DI boxes are used to change the output signal from one source and change the level and impedance to match a microphone level signal input into a mixer. The most common application of a direct box is when connecting an electronic keyboard or similar electronics to a sound system. The DI box allows you to connect into a snake or existing mic lines and send the signal up to 700 or 800 feet away. By converting line level signal to a balanced signal mic level, you also avoid RF problems and crosstalk in the mic cables back to the mixer. The most common DI box is the Passive Direct Box. This unit is often used to connect Guitars, Keyboards and other electronics that have a line level out from the instrument. Often the line level voltage is between .5 volts to 3 volts (Some DI’s units can handle an input signal of +8dB (or 10 volts)). As a passive unit, the signal is as good as the transformer that is built within it. An important feature of many good quality DI boxes is ground lifting. Since there is no universal standard for audio equipment and instruments, grounding problems often occur (Perhaps the new ISO9000 standard may help…. but let’s see what happens in the next few years.) Many DI boxes are able to isolate grounding problems between various items of equipment. Generally, by going through a DI, you loss from 3 to 6dB of signal. ** Note: Not all DI boxes sound the same. As the signal levels get higher, the DI box may add some distortion. On an electric Guitar it may be a good thing. On a Keyboard it can sound awful. Before you blame the soundman for that poor keyboard or instrument mix in the monitors, try a different DI box or even an Active box. 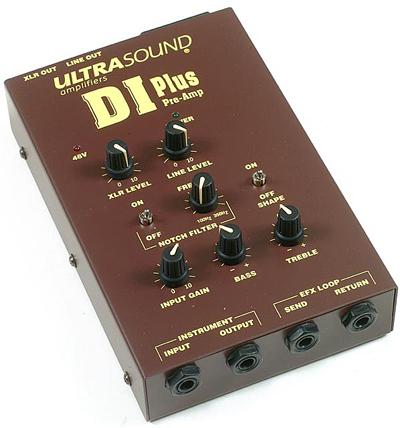 The second most common DI box is the Active Direct Box. These units either work from a battery or phantom power from a mixer. An active DI box can handle higher signal levels and put out a higher signal level. Furthermore, the frequency response is often better too. When you are performing in a room that has low reverberation and good performance qualities, it is better to use the active DI box. Also if you plan to use a digital signal in reinforcement or recording, use the active DI box. Generally, a DI has 0dB signal loss. 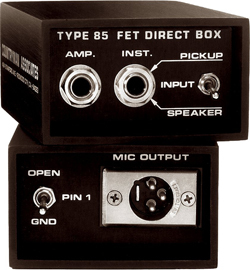 Active Direct Box with Preamp. A new type of Direct Box may have a built in preamp that works off the Phantom power of a mixer or it might have batteries or it might have an AC/DC adapter. I haven’t had a chance to test one, but the are supposed to boost a signal level up to 10dB. Some of these units can also work as a mic preamp as well but that is only when your mixer dies and you need 1 mic to get through the show. But that would only work if you have a box that is self powered or with an AC adapter. 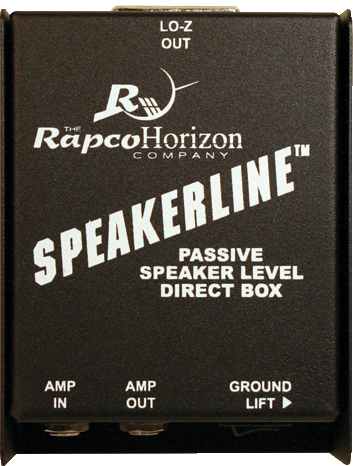 The less common DI box is called the Speaker Director Box. A speaker director is used when the only signal output available is from an amplifier. Many older 16mm film projectors use a 10 watt tube amplifier for driving a 10 watt speaker. A tube amplifier should always have a nominal load of 4 ohms or higher on the output or the amplifier will burn itself out. A good speaker director will present to the amplifier a proper load and convert the signal to mic levels to either a 150 or 600 ohms. You should never take a signal from an amplifier direct into a mixer. You will either fry the channel or the power supply in your mixer. Remember, all good direct boxes have ground lift switches and there are a few units that have an automatic grounding system. Make sure that your direct box has this feature. Another common method of connecting low level electronics to a sound system is by using a line matching transformer. The transformer is usually mounted in a barrel type connector with a ¼ inch-tip sleeve connector at one end and an XLR three pin connector on the other end. The whole unit is often about 4 inches long. There are only a few manufacturers of these products and they seem to work. Radio Shack, EV and other mic companies has two types and churches tend to buy these because they are so visible and easy to get. One converts low level line outputs to mic levels. This unit with the ¼” female to male XLR can handle a lot of power but, there is a major penalty when you drive this transformer to hard. In bench measurements, when the sign was greater than 2 volts, it introduced distortion. At 3 volts there was 10% distortion. At 5 volts there was about 20% distortion. On a guitar this may be desirable or in a noisy night club show where you won’t hear the distortion, but in a church, the distortion can be very unpleasant. As long as the sign stays below 2 volts, this transformer will do a reasonable job. The response to this question was remarkable. What was very surprising was when I saw who was answering the questions. First of all, lets look at the question. – The request was to know if an active DI can boost an audio signal from -20dB to +0dB. First of all, we should know what -20dB means. In HI-FI, -10 and -20dB is the standard used to connect from stereo equipment to equipment. Part of the reason for this standard is that a lower signal has few problems with noise from RF and HUMs and at that level, it is cheaper to provide RF protections at -10dB. However, this signal is too low to manipulate for editing without adding noise that is inherent of all audio equipment and signals – even digital signals. In Pro Audio, we use +4 as a standard. Part of the reason (among other things) for this higher output is to boost the signal high enough for a greater signal to noise ratio. Let me explain. A line level to line level signal often already has a signal to noise ratio of 60dB or more. 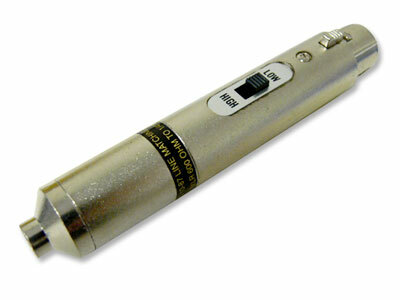 A microphone can have a signal that is from – 80dB to +10dB. That is 90dB of dynamic range. If the low level -80dB signal is clean – that is little or no noise, by boosting it to +4dB means that when you split the signal for monitors, effects and recording outputs, when you change the signal with the channel EQ and then send the signal out of the mixer, your original signal should be (almost) noise free. (If you have a cheep mic, that can often be a problem when micing a person’s voice at a distance.) In otherworldly, the hotter the signal, the better for Pro Audio- and all church sound system come under this label. Back to the Question – Many active DI boxes have switches that can cut a signal down. Most Active DI boxes have 0dB, -10dB and -20dB. Some DI boxes also have -45dB. These are pads. Pads are loads created with resistors and other components to cut the signal down when the input voltage is too high. A passive DI box will loose between 3 to 6dB of signal. For many sound sources, this is OK. Also, passive DI use transformers. All transformers have a unique sound. 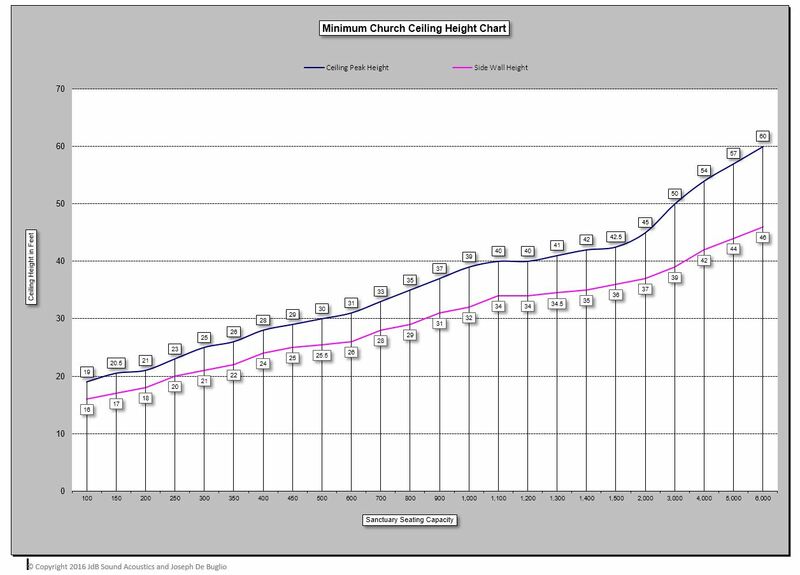 If your church has an NC above 42dB, the sound of the DI will not be noticeable. If the church has an NC below 42dB, then everything counts. Active DI boxes offer 0dB signal loss and since they don’t use transformers, they add far less coloration to the original sound. In order for a Direct Box to Boost a -20dB signal to +0dB, you need internal amplifiers like a mixer has. To the best of my knowledge, there are only a few Active DI boxes that have such abilities. Generally, they should be called Active DI with Preamps. Most of the common Active DI boxes do not have this ability. These DI boxes with pre amps and gain controls built in require 24 volts or more to boost a signal. A full boost of signal can be achieved with a 48 volt phantom power supply as supplied in many pro quality mixers. Some of these DI’s can boost a signal to +20dB, but doing this without gain noise is remote. In a club with 55dB of background noise this probably isn’t a problem – in a church with 40dB of background noise and preamp noise will be a major issue. The solution for the guitar player is to use a guitar foot pedal pre amp that can also add Bass, mid and treble tone controls – then go into a DI box. The signal will be boosted before going into the DI box – as it should. For other low level signal, you can use a Guitar pre amp or- you can use a unit like the Symetrix 202. It is a two channel pre amp with phantom power. It can be used as a mixer by itself or to boost a low level signal. 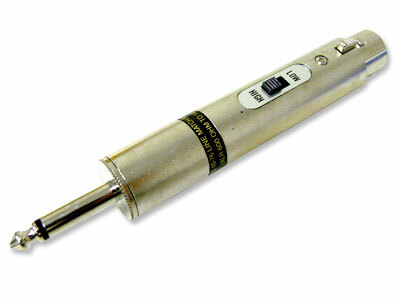 It can handle almost any kind of input and convert it to 600 ohm balanced load. You don’t need a DI box with this unit. it has a ground switch, a pad, a gain control and phase switch. Because it has two channels, you can mix two sounds, like a mic and guitar before sending it to the main mixer, or mix 2 acoustic guitars. The option is yours. What prompted this writing is the fact that well known audio experts are either telling people that any active DI box can boost a signal, or they are accepting this info as fact. Yes, there are some active DI boxes that have a built in line amplifier to increase the signal which makes these unit more than a pure active DI and if you read the product label, it will tell you if there is a line amp included. Question from those who search the web. The long answer is – DI boxes are not pre amps or mic signal amplifiers. They are passive devices. Even an Active DI box is passive. All it does is give you better control of the input sign to prevent clipping of a hot signal. Di Boxes convert one type of signal to another. That said, there are a few expensive boxes that are suppose to work both as a DI box and as a preamp for line level signal. They can not be used to manage mic level signal whether balanced or unbalanced. 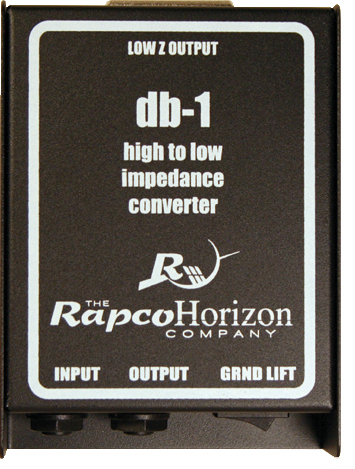 DI boxes are 1/4 inch inputs and XLR and 1/4 inch outputs. When they say preamp/DI box, what they are saying is that they can change the bass, treble, mids and add sound effects to the hot signal and then send it to the mixer at mic level or line level for a Guitar amp. If you are looking to boost a mic signal, you need a pre-amp and they are many phantom powered, battery powered, USB powered and DC/AC wall wart powered pre-amps. Can you connect from a Mixer to an Amp Directly? The Long Answer is – Amp inputs are line level. HIFI/Consumer products connect at -10dB. Pro products are setup for +4dB. The key here is to have the proper type of cable connections. It is best to run from XLR to XLR or TRS to TRS or TS to TS. If you have to go from XLR or TRS to TS, and you are having any hum issues then a DI box will help you out and correct the grounding issues. What is the best way to connect from a computer or Laptop or Ipod/Iphone/Ipad to a mixer for music playback? The proper way to take a headset signal output to a single mixer input is to connect with two Line Match Transformers. You need a transformer for both the Left and Right channel. Why? One of the sacred rules in audio is that you can split or “Y” an output signal to two devices but never combine or “Y” an input signal to the input of a mixer. In many churches there are Cassette players, MP3 players, CD players and other playback devices that have only one channel working. When you “Y” an output to a single connection, you are creating an improper load and that often leads to a Left or Right channel being burned out over time. There are summing boxes that you can use but they can be expensive. Better yet, if you have two free input channels or you have stereo input channel use them. If you only have 1 channel, the line match transformers will protect the mix and the playback device. Posted in Church Sound Systems | Tagged: Amplifier, Church Sound Systems, digital mixers, Direct Box, Direct boxes, EQ. Equalizer, JdB Sound Acoustics, line matching trasnformers, Microphones, Mixers, Sound, Sound System | Comments Off on Direct Boxes….. If your church is using an Analog mixer, what make is it and how well does it meet your needs?